Narendra was a young graphic designer who comes from a small peasant family but had no farming skills and was forced to shift to an urban job in the city. Always fascinated by agriculture, he went to Amrita Bhoomi as a volunteer intern for a year and learned how to work the land. 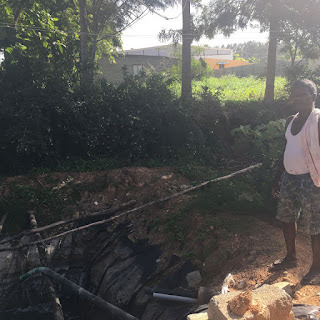 Today, he has restored his one acre farm on the outskirts of Bangalore which was used as a dumping yard by the Bangalore city municipality. Glass shards and syringes still dot the field. Because it was unfit for food cultivation, Narendra is now using waste water from buildings around his farm to grow flowers. His father who thought he was crazy initially, is now inspired by his son and takes care of his field. Narendra considers himself a lifetime volunteer and supporter of Amrita Bhoomi and is thrilled he could start a new life closer to the land. He has many plans for his farm- a root garden is coming up soon. 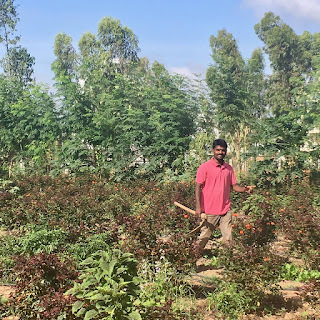 As a side income he is working as a head gardener at an apartment complex in suburban Bangalore where he has set up an organic garden to sell affordable organic veggies to the residents of the apartments. Narendra is an inspring example for rural youth who with their creativity, diligence, and some support (from peasant schools) can return to the land and live satisfying lives as new farmers. Although most around Narendra’s farm have sold off their lands – Bangalore city seems to swallow up farmland rapidly, Narendra is adament. “I will never sell our farm,” he says.